CJ's Thumbs Up Foundation: More blogging...because there is more news! You don't often get two blog posts in 24 hours but there is definitely much to report. First of all, I hope everyone who was interested in attending the Stella & Dot Trunk Show got the notice that it has been rescheduled for NEXT Thursday, 7/22. We hope you can make it. As before, online orders will also be accepted (go to the link above for more details). Secondly, for those of you who haven't heard it through the Grapevine, I am starting a new job on Monday. I was recently hired by The Faison School for Autism to work about 4 days a week as a speech language pathologist. Yes, I am excited to work for one of the best programs for Autism in the Richmond area. It seems that they are excited to have me as well. It's definitely bittersweet as the job has been necessitated by current economic issues at romp n' roll. The summer has just been way too slow and we are still catching up from expenses brought on by the move. I will still be teaching at Romp n' Roll a few days a week (Wednesdays and weekends) as well as continuing my regular administrative duties with the business but a lot of work will now fall to Roger and the rest of our excellent team. I am confident that our level of quality will remain stellar. Not so sure how I will balance Romp n' Roll, CJSTUF, AND the new job but I am learning to be a better delegater. We do have some exciting CJSTUF events on the horizon. Mark your calendars for August 4th. 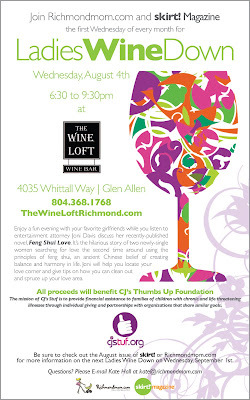 We will be the benificiaries of Wine Down Wednesday at the Wine Loft in Short Pump. This is a super fun event and a great "girls night out" opportunity. I went to last night's event (benefitting Hugs & Kisses) and it was so much fun! The $5 admission goes straight to CJSTUF. In addition, they will be selling $1 raffle tickets for great prizes (all the raffle money goes to CJSTUF as well). I think we'll probably have some CJSTUF swag available plus some romp n' roll goodies. Lots of other prizes as well. There is a cash bar for great wine, free appetizers, and a cozy but elegant atmosphere. I will remind everyone about the date later in the month but definitely plan to attend and bring a friend. I will be speaking briefly about the Foundation but it's mainly a great social time and a good opportunity for networking. I guess that will do for now. Talk to y'all more soon! Congrats on the job. You will be such a great addition to Faison! You are one busy lady! Take care of yourself.